Meet the next generation of handheld 4K digital film cameras. The Blackmagic Pocket Cinema 4K is making waves at NAB 2018. That’s not an exaggeration. It has all of the features you want and it’s portable, affordable and professional. In fact, it’s packed with features. This 4k camera has a 4/3 size sensor, 13 stops of dynamic range and dual native ISO up to 25,600. You can expect stunning HDR images and amazing low light performance. The external controls give you quick access to essential functions, while the large 5 inch touchscreen makes it easy to frame shots, focus accurately and change the camera settings. It records images onto standard SD/UHS-II or CFast 2.0 cards in RAW and ProRes at up to 120 frames per second! 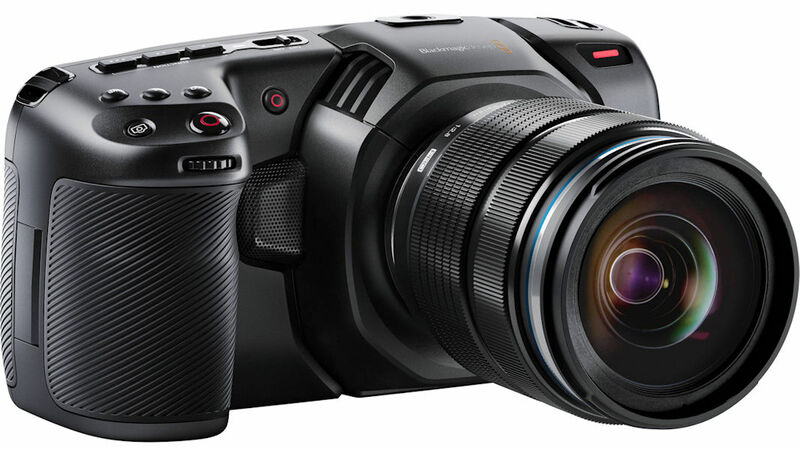 The Blackmagic Pocket Cinema Camera 4K also has an MFT lens mount, built-in microphones, mini XLR input, full-sized HDMI, 3D LUT support, Bluetooth, USB-C Expansion Port and more. On the top of the camera, there’s a handy HFR (high frame rate) button for 60fps capture in 4K. It will capture up to 120fps in HD. There’s also a stills button on top for still images at 4K UHD resolution. That MFT lens mount means that it’s compatible with the lenses you already own. The MFT mount is extremely flexible and allows for different lens adapters. You can get adapters for PL, C, EF and more, so you can use lenses from makers like Canon, Nikon, Pentax, Leica, Panavision and more. This camera uses the same Blackmagic OS as URSA Min, so you get the world’s most advanced camera operating system along with many of the same professional features you would normally only have on larger cameras. It is available for pre-orders right now and ships in September. Prices start at $1295 (no lens). Pre-Order the Pocket Cinema 4k Here. Another great item from the show is the Television Studio 4k – with 8 channel 12G-SDI inputs, 2-channel audio mixer, and signals up to 2160p60. It has all the same features as the HD model we talked about last year. It also have DVE processing, CCU function (for compatible cameras) and 2-clip media pool for fill and key.